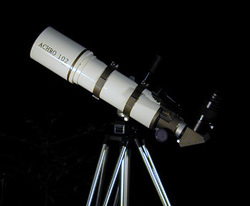 The Achro 102f6 was the first in a series of Burgess Optical achro refractors. The OTA is shown on a photo tripod and head with the SWA 38 EP. What looks like a bite out of the focuser end of the scope is actually a Burgess Optical red dot finder, which, being black, blends into the night background. Fully machined and baffled dew shield - over 100 baffles in the dew shield alone! The Achro 102f6 was discontinued in 2004, with the last ones sold in early 2005. 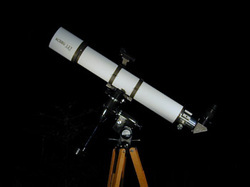 The Achro 127f8 was one of a series of Burgess Optical achro refractors. The OTA is shown on a red oak tripod with a CG-5 clone mount and the SWA 38 EP. The Achro 127f8 was discontinued in 2004, with the last ones sold in early 2005. The 127f8 has proven to be a fine telescope, offering both reasonably wide field of views and nice planetary views.